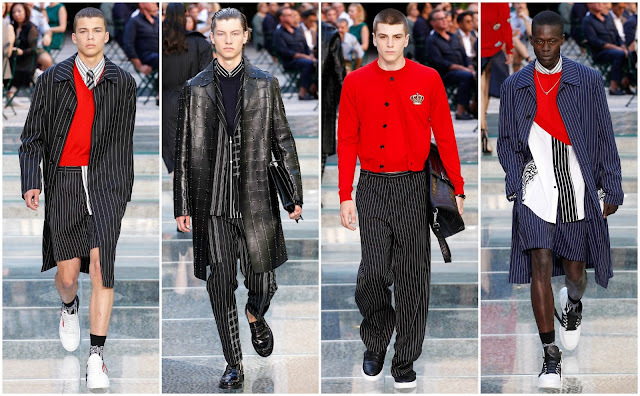 It’s an interesting year for the house of Versace. The brand is performing well, the sister line Versus is also expanding efforts with a collaboration with Zayn Malik. Next month marks the 20th anniversary of the death of Gianni Versace who was murdered in July 1997. The Assassination of Gianni Versace: American Crime Story is a television series set to premiere later this year on FX in the US. Donatella Versace, the brand’s overseer, decided to show the Spring 2018 menswear show at the Versace house on via Gesu at Milan Fashion Week last weekend; it was a homecoming—the brand has favoured industrial spaces of late but this was a reexamination of the house codes, the fundamentals and the stylistic presence. There were familiar items: pinstripe suiting, rococo printing which has been counterfeited to death at this stage, sumptuous silks. It entered heritage brand territory but, needless to say, that doesn’t mean it has to be trite—Donatella simply wouldn’t let it become that. Her prerogative was to inject the classics with newness, transposing the datedness of the aesthetic to something contemporary. 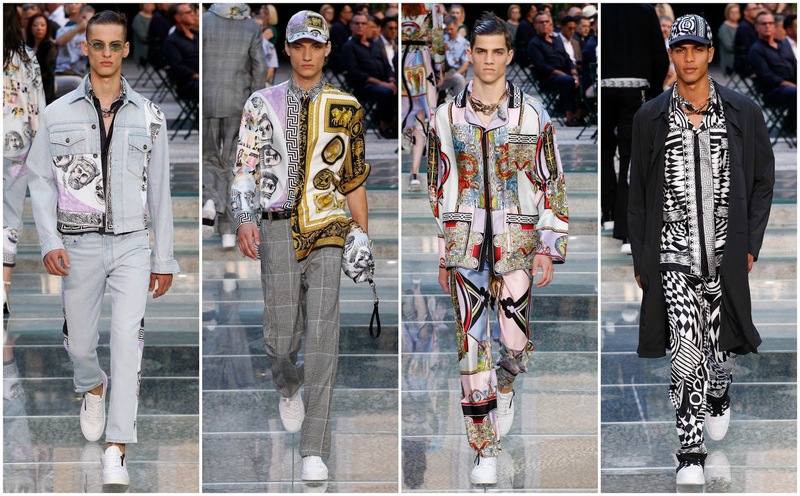 The virility of the Versace man is often off-putting but Donatella infused this show with a certain campiness that has been absent for some time, hitherto. 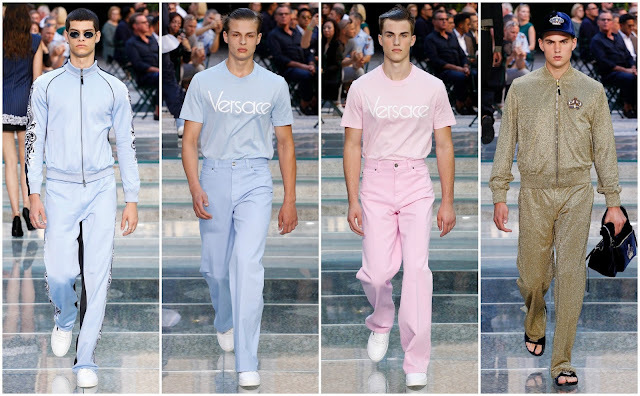 A baby blue tracksuit and 80s-inspired club outfit consisting of a branded t-shirt and wide-leg trousers; similar looks in baby pink emerged—a pink tracksuit? It was a submergence into days gone by and it was delightfully amusing. A printed silk pyjama combination and white trainers? Ostentation reached peak levels and the richness of the look risked being an eyesore, however, it’s memorability forgave it. A gold tracksuit with a crown emblazoning… “fabulosity”, one presumes, is something Donatella wanted to achieve. Favoloso. However, that’s not to say she entirely ruled out the fearless machismo: the opening half of the show conveyed the focus and tailoring prowess of the house. In a turn of events, they were slightly dressed down—shirts were untucked, some were missing ties, trousers were slashed at the knee creating sporty shorts. The addition of baseball caps and adidas ‘Superstar’-esqe trainers contributed to the sporty effectiveness of the show. Furthermore, this show was an ode to Donatella’s late brother. The cornerstones of his menswear, and womenswear, efforts were all present in the show. It subverted the house’s heritage and it packed a punch, it had character, it was distinctly on-brand. It’s the year of Versace… but to the woman at the head of the house every year is the year of Versace.